St Paul’s Cathedral, London, is a Church of England cathedral, the seat of the Bishop of London and mother church of theDiocese of London. It sits at the top of Ludgate Hill, the highest point in the City of London. Its dedication to Paul the Apostle dates back to the original church on this site, founded in AD 604. The present church, dating from the late 17th century, was designed in the English Baroque style by Sir Christopher Wren. Its construction, completed within Wren’s lifetime, was part of a major rebuilding programme which took place in the city after the Great Fire of London. The cathedral is one of the most famous and most recognisable sights of London, with its dome, framed by the spires of Wren’s City churches, dominating the skyline for 300 years. At 365 feet (111 m) high, it was the tallest building in London from 1710 to 1962, and its dome is also among the highest in the world. 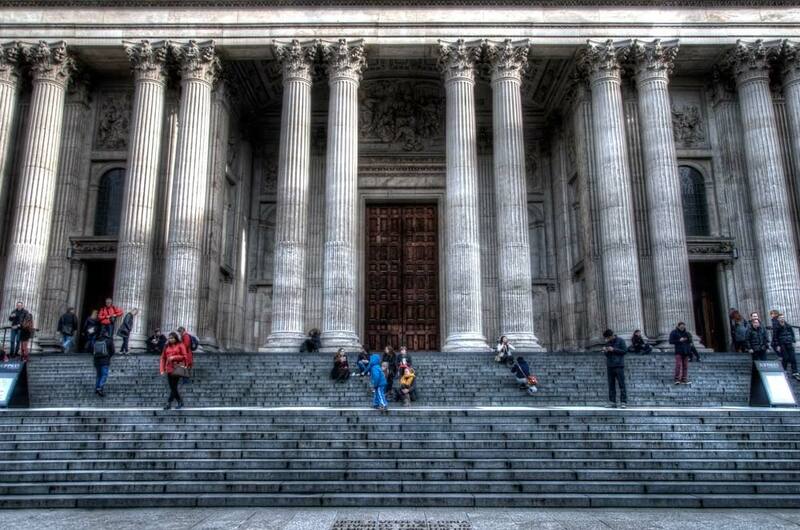 In terms of area, St Paul’s is the second largest church building in theUnited Kingdom after Liverpool Cathedral. St Paul’s Cathedral occupies a significant place in the national identity of the English population. It is the central subject of much promotional material, as well as postcard images of the dome standing tall, surrounded by the smoke and fire of the Blitz. Important services held at St Paul’s have included the funerals of Lord Nelson, the Duke of Wellington, Sir Winston Churchill andMargaret Thatcher; Jubilee celebrations for Queen Victoria; peace services marking the end of the First and Second World Wars; the wedding of Charles, Prince of Wales, and Lady Diana Spencer, the launch of the Festival of Britain and the thanksgiving services for the Golden Jubilee, the 80th Birthday and the Diamond Jubilee of Elizabeth II. St Paul’s Cathedral is a busy working church, with hourly prayer and daily services.